Virtus Pro officially parts ways with Byali. Paweł “Byali” Bieliński is no longer associated with Virtus Pro. His entry onto the free market definitely opens up a lot of possibilities for other teams and organizations who want to boost their firepower. 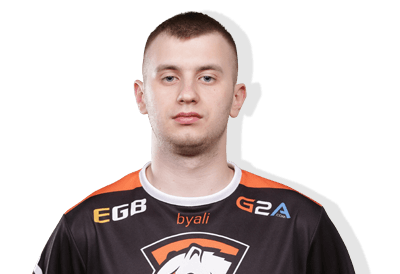 The player has been one of the strongest players on the Virtus Pro lineup. His ability to constantly provide decent numbers on the server made him an invaluable player on the Polish roster. In a team that is truly known for its volatility and inconsistency, Virtus Pro is one of the fan favourite teams despite not providing the best results. Pawel has been playing in a mixed team under the name Mikstura. The mixed roster has been playing in the closed qualifier for the European Minor. The team will compete in the closed qualifier and hopefully get a chance to play in the CS: GO Minor later in the year. Byali’s departure is not a surprise. Byali’s parting of ways with Virtus Pro was not a surprise. The organisation had announced in August that Byali will leave the team after the FaceIT London Major 2018. The announcement on their website mentioned that the decision was a mutual decision. Byali departure was an agreed upon mutual decision by both sides. Our entire team is grateful to Paweł, and we wish him only success in the future. It has been a great journey together. We will be ready to announce our new player after the London Major. Roman Dvoryankin, Virtus.pro general manager. This decision obviously came after months of poor performances by the Polish side. We saw the departure of Taz first and then Snax also parted ways with the organisation. The shuffling of the roster continues with the parting of ways with Byali. This action allows Byali to compete on a new team. There is hope that the team can perform much better than their current performance. For now, Byali is a player who can add value to any roster that he decides to join. If he can improve his individual performance to resemble his peak form, he will be a definite addition one of the big teams.